We’d love your help. Let us know what’s wrong with this preview of Cycle of Hatred by Keith R.A. DeCandido. To ask other readers questions about Cycle of Hatred, please sign up. Why is this book so expensive to purchase, as a paperback and used? Does anyone know? Was there hardly any copies made or did it not do well. Thank you, trying to find all books relating to warcraft storylines. Meg I wanted to know the same thing! Did you ever figure it out? Cycle of Hatred describes the relations between Theramore and Durotar, and of their rulers Jaina Proudmoore and Thrall, with a plot hatched by a demon to spice things up. This one did a better job than any of the others of actually leading readers/players into the game. So I would probably recommend this one as a go-to book for people who are new to this universe. As a WoW player myself, the best part of this book for me was just being in the world. What lets Cycle of Hatred down is the writing and story...which are pretty important in a book. The writing was kind of boring and a strange mix between high-fantasy and really modern witticisms/slang/etc. The WoW game itself mixes the two as well, but it just felt like the author of the book couldn't figure out the right way to mix the two. For the most part the characters also felt contrived and characterize As a WoW player myself, the best part of this book for me was just being in the world. What lets Cycle of Hatred down is the writing and story...which are pretty important in a book. The writing was kind of boring and a strange mix between high-fantasy and really modern witticisms/slang/etc. The WoW game itself mixes the two as well, but it just felt like the author of the book couldn't figure out the right way to mix the two. For the most part the characters also felt contrived and characterized wrongly. About 90% of what the three main women characters talk about is how hard it is to be a woman while being a solider, leader, mage, etc. All the characters seemed one-sided and flat, and I couldn't really invest in any of them as they were written. The story itself seemed like a placeholder story...nothing really happened, and the "boss fight" at the end lasted about - literally - two sentences. The Burning Legion has been defeated, and eastern regions of Kalimdor are now shared by two nations: the orcs of Durotar, led by their noble Warchief, Thrall; and the humans of Theramore, led by one of the most powerful mages alive -- Lady Jaina Proudmoore. But the tentative peace between orcs and humans is suddenly crumbling. Random attacks against Durotar's holdings suggest that the humans have renewed their aggression toward the orcs. Now Jaina and Thrall must avert disaster before old hatreds are rekindled -- and Kalimdor is plunged into another devastating war. Set a year prior to the opening of the World of Warcraft MMO, "Cycle of Hatred" would perhaps better be titled "Cycle of Blah." Unlike most novels set in the Warcraft universe, this one doesn't really add anything at all to the world. The plot is mediocre and has no twists or turns - it's straightforwardly flat. You easily guess what's going to happen. Jaina Proudmoore and Thrall aren't true to their established characterization; it feels like the author didn't do any research before writing this book. There are three strong female characters in the book; DeCandido constantly harps on how a woman has to work harder than a man to be in power. It's very overdone, and I was rolling my eyes the second time it came up, let alone the third, the fourth, etc. The characters and plot feel very flat, very one dimensional. For me, this is the worst of the World of Warcraft novels. I've read all multiple times, and this is my least favorite and the least enjoyable. It's blah - not good, not bad - just blah. If you're a WoW player, or curious about the universe, and want to read some of the books, I recommend you pick something other than this one. 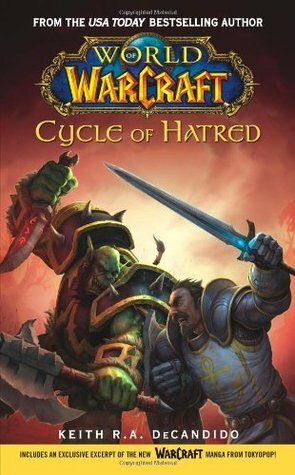 Of all of the Warcraft Novels that Bookworm has read Cycle of Hatred has been considered one of the worst. But the tentative peace between orcs and humans is suddenly crumbling. Random attacks against Durotar's hol Of all of the Warcraft Novels that Bookworm has read Cycle of Hatred has been considered one of the worst. The main flaw is that the plot is rather dull. The whole premise is avoiding an epic battle. A worthy pursuit but ultimately does not fit in with Warcraft as epic battles are its backbone, hence its name. Overall, the plot does sag in a few places and can seem anticlimactic. Lots of buildup but little payoff. Another point of criticism toward the text is how it portrays women in a way that some would interpret as sexist. There is surprise by the fact that Jaina Proudmoore is a ruler and wizard and a woman, and several other characters bring this up as well. Some readers take offense to that, viewing it as sexist. A sad fact is though, that it’s true, both in Real Life and in Warcraft it would appear. Women often do like to work twice as hard as men to though half as good. Warcraft does strike Bookworm as a world with traditional values regarding women, at least among humans. While there may be plot elements that fall short, the main reason this book has its rightful place in Warcraft Lore is its message. Hatred is a powerful force. One group commits a crime against another and they retaliate and they retaliate back over and over again until both are utterly devastated. Unless, they want the death and destruction to stop they need to swallow their pride and break the cycle of hate. Only then will there be peace. This stressed constantly and even mentioned in the subplot with Jaina Proudmoore about letting go of past mistakes and working towards a better future. This is a message that we in the Real World desperately need to embrace. Also not every single book needs to bring something brand new to the lore. Sometimes it is interesting to explore familiar elements in a new light and see how things work in between discovering the new things. While perhaps not the strongest Warcraft, its message and its characters make it a worthy edition to the lore. So no…Bookworm does not think that this is the worst Warcraft Book ever written. Not the best but not the worst. Pretty good so far, with a somewhat choppy writing style. However, I was just jarred out of the story by an idiotic mistake that any speaker of English ought not make: on page 87 "she destroyed only his avatar....until [she] sired..." end of idiocy. At least thus far. Also, pp 118-119: if the humans say okay, then the book says the other group "isn't able to be seen violating ... when the humans were". I can figure out what it means, but really some one needs to think and proofread, not just publish the first scribbles that come out of the crayon. Finished the book, now for a follow up comment. Overall though, even with the complaints above, this was a good book. It dealt with the age old issue of "us" against "them" which pops up in every culture, in a believable way for most of the story. It had demons and dwarves, elves and mages, half breeds and invaders. It had a recent war, and a land that was being rebuilt. Overall, I think this is worth reading again, although the bad writing does cause me to tend to treat this as something written by a beginning writer, and a draft at that. I love all most things that are Sci-Fi/Fantasy: books most, then games and movies. I have been playing World of Warcraft since friends introduce to it when Burning Crusade game out. I love the idea of the the game, especially the cut scenes or quest that tell you the back story. Finally I thought I would read one of the WoW novels, plus my friend had been bugging me too. I read Cycle of Hatred (World of Warcraft #1) by Keith R.A. DeCandido. This is my first novel from Blizzard, as well as, WoW. I love all most things that are Sci-Fi/Fantasy: books most, then games and movies. I have been playing World of Warcraft since friends introduce to it when Burning Crusade game out. I love the idea of the the game, especially the cut scenes or quest that tell you the back story. Finally I thought I would read one of the WoW novels, plus my friend had been bugging me too. I read Cycle of Hatred (World of Warcraft #1) by Keith R.A. DeCandido. This is my first novel from Blizzard, as well as, WoW. I enjoyed the to plot and familiar characters. It was an entertaining read, with a few grammar/phrasing issues; like that Aegwynn sired a son. Men sire, women conceive or birth. I did like that the speech of the Orcs and Trolls was like in game, I could hear the Jamaican type accent when the Trolls were speaking. Here are my pros for the this book: fantasy and adventure that keep me interested and turning the pages, strong female characters (hey I am a girl so I like strong women), and the fact it is based on WoW and Warcraft game lore. Here are my cons: most of the male characters (besides Thrall) were either villains, curopt, or wimps; variations on what I know for the geography in WoW (Durotar have fishing, I have fished there I game so I know); and to me the epilogue was predictable. Cycle of Hatred was a fun, easy, read rich with lore from the World of Warcraft characters I adore. Lady Jaina Proudmoore takes center stage and I adored reading about Jaina. Revered as one of the most powerful mages alive and a leader Jaina has a lot on her plate. With the Burning Legion pushed back Jaina focuses on working on the alliance between humans and orcs. While she is eager to work with Thrall to come to a solution not all the humans who follow Jaina are eager for that solution to come Cycle of Hatred was a fun, easy, read rich with lore from the World of Warcraft characters I adore. Lady Jaina Proudmoore takes center stage and I adored reading about Jaina. Revered as one of the most powerful mages alive and a leader Jaina has a lot on her plate. With the Burning Legion pushed back Jaina focuses on working on the alliance between humans and orcs. While she is eager to work with Thrall to come to a solution not all the humans who follow Jaina are eager for that solution to come into effect. Thrall, the proud leader of the Horde wants peace between the orcs and the humans as much as Jaina. Yet with all the accidents and mishaps occurring for the orcs Thrall is unsure if that will ever happen. Busy with keeping the orcs under his command Thrall wants to believe Jaina but also does not want to call his followers liars. Walking a delicate line Thrall searches for the truth of what is happening to push the orcs and humans to war once again. 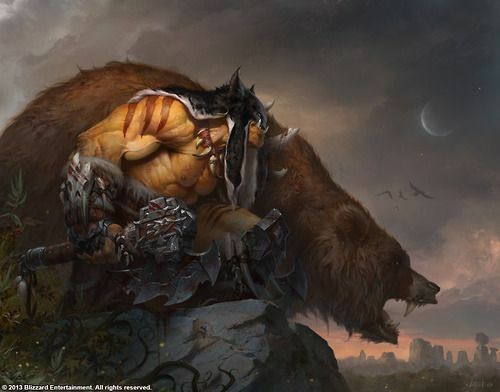 World of Warcraft: Cycle of Hatred written by Keith R. A. DeCandido. This book starts out right after the war againest the Burning Legion. The orcs and the humans made an alliance during the war and, as the title describes, things are on thin ice between the two. Lady Jaina Proudmoore and Warchief Thrall are the leaders of the two races and are feverishly working to keep the alliance between the two races. While Thrall and Jaina are working on keeping the alliance, a force is trying to rip the al World of Warcraft: Cycle of Hatred written by Keith R. A. DeCandido. This book starts out right after the war againest the Burning Legion. The orcs and the humans made an alliance during the war and, as the title describes, things are on thin ice between the two. Lady Jaina Proudmoore and Warchief Thrall are the leaders of the two races and are feverishly working to keep the alliance between the two races. While Thrall and Jaina are working on keeping the alliance, a force is trying to rip the alliance apart. That is where the story begins. Being that this is only the second WoW book I've ever read, I only have one other book and author to hold it up to and that's Christie Golden's Athas... This book in comparison is really not that good. But, as usual, I still loved Jaina Proudmore AND Colonel Lorena was an awesome new character for me to get to know and enjoy. This book had three powerful woman at the hem of it and that's the reason it got a 3 star instead of a 2 from me. Jaina, Lorena, and Aegwynn were refreshing to read and qui Being that this is only the second WoW book I've ever read, I only have one other book and author to hold it up to and that's Christie Golden's Athas... This book in comparison is really not that good. But, as usual, I still loved Jaina Proudmore AND Colonel Lorena was an awesome new character for me to get to know and enjoy. This book had three powerful woman at the hem of it and that's the reason it got a 3 star instead of a 2 from me. Jaina, Lorena, and Aegwynn were refreshing to read and quite enjoyable to get to know. Leaning about the Burning Sword was also quite interesting. But, alas, that is where all the 'like' ends for me. My brother gave this to me as a joke for Christmas, since we both play World of Warcraft with tongue planted firmly in cheek. I think it's funny and mostly harmless, thought it may be killing my brain. A bit boring and confusing in the first third, the book is a fun read that gives some insight into Jaina, Thrall and Aegwynn. There were some fun references from the game, such as the neutral and opportunistic mentality of the goblins, but other than that the book feels as a filler. This novel was very short, under three hundred pages, and there was also many different characters that we read from so it ended up feeling very quick with mostly action or a quick moving plot. I prefer my books more fleshed out with more set-up behind a story or character's motives but I can understand the appeal of a go, go, go book and it was great to read one after a little slump. Alright, so there a couple of expectations you need to set before you attempt any Warcraft book. First, you need to expect that geography will play a huge part and that your familiarity with Azeroth (and, in certain cases, Draenor) will benefit you hugely. Second, you need to expect a very different sense of experience from the gameplay, especially in World of Warcraft, where the subtleties of warfare and magic are boiled down into easily repeated animations operating on a time-based set of mech Alright, so there a couple of expectations you need to set before you attempt any Warcraft book. First, you need to expect that geography will play a huge part and that your familiarity with Azeroth (and, in certain cases, Draenor) will benefit you hugely. Second, you need to expect a very different sense of experience from the gameplay, especially in World of Warcraft, where the subtleties of warfare and magic are boiled down into easily repeated animations operating on a time-based set of mechanics. Third, and perhaps most importantly, you should expect a decided lack of true climax or resolution because, after all, these books are designed to motivate you to play the games and experience the true drama of this universe for yourself that way. Approach Cycle of Hatred with all these in mind makes for a good read. Like the other novels from this canon, it operates within a limited timeframe that explores the complex geopolitics on the eastern shores of Kalimdor, where Thrall, the orcish shaman who leads the new Horde, and Jaina Proudmoore, a powerful human mage who heads the human bastion of Theramoore, work together closely to maintain the alliance between their peoples. This alliance is what helped the residents of Azeroth, both native and alien, to overcome the demonic onslaught of the Burning Legion and their attempts to keep it functional are due in large part to the horrors of that war and the war before it which brought the orcs to Azeroth under the demons' power in order to destroy the lives of species such as the humans. With all that backstory floating around--and a lot of it is succinctly but meaningfully laid out early in this book--it might be easy to lose sight of the relatively small skirmishes that constitute most of this novel's action. What DeCandido brings to the table, however, is a focus on key characters and events that keeps the rising action of this book moving. As the reader uncovers the influence of the Burning Blade, discovers what Jaina finds in what is supposed to be an uninhabited region, and keeps up with Thrall's evolving leadership, he or she feels the tension that grips Azeroth despite its unformed nature. The genuine threats to the world's stability, masked and cloaked as they are, are slowly revealed and dealt with. It's been on my to-do list for ages to read all the Warcraft novels out there. I've been playing the games since Warcraft 2, might as well owe up to it! Years ago I read Day of the Dragon and genuinely disliked it. As Blizzard put just about all their lore developments prior to MoP in books and comics, I wanted to read up. Goodreads told me this is the first book, so off I went. It's incredibly short. Set three years after Warcraft 3, pretty much at the start of the World of Warcraft, it is set i It's been on my to-do list for ages to read all the Warcraft novels out there. I've been playing the games since Warcraft 2, might as well owe up to it! Years ago I read Day of the Dragon and genuinely disliked it. As Blizzard put just about all their lore developments prior to MoP in books and comics, I wanted to read up. Goodreads told me this is the first book, so off I went. It's incredibly short. Set three years after Warcraft 3, pretty much at the start of the World of Warcraft, it is set in Kalimdor. Trouble is brewing between the Theramore humans and the Horde in Kalimdor. On both sides the conflict is fanned by a mysterious group called the Burning Blade. Jaina and Thrall try to solve this conflict, as it looks like war might break out. So far so good. There's not really a whole lot of action in the book. A lot of vignettes about rising trouble, and some investigative work, an interlude with Aegwynn and stories about her past, and then the force behind the Burning Blade is defeated. It sometimes felt like fan-fiction and not a real professional novel. Characters were incredibly flat. I guess Jaina is the main protagonist, but she doesn't really stand out as having a personality. None of the characters really do. There's an air of non-seriousness about everything, even the bloody battle scenes. Why still three stars? Because I enjoyed reading about Kalimdor, and familiar names. I am the odd person who gets the shivers and feels at home when entering The Barrens, so it felt like reading about my home. Yeah, weird, I know. Of course that also drove me a bit mad, because the book's Durotar is very different from the game's version. Forest around Thunder Ridge, farmland, no fishing? I don't think so. What I thought? Very well... Thrall and Jaina are not that well portrayed. No character in this novel was. One think that upsets me is that this novel has no new lore. I am an avid reader of Black Library books and Forgotten Realms book. I expect not only a good novel but something new... some new fluff... some new insight. This novel didn't had any. The plot is this: Someone is threating the orcs and human alliance and Jaina and Thrall can't understand who. After some investigation and with help of some old old wizard they find out and stop the bloodshed. Nice isn't it? I couldn't understand this novel... The orcs are woman haters and human females threat the man's part as weak and corrupted with tendencies to be lazy. It was awful. This book makes me wish there was a 3.5 stars. I dunno, it certainly wasn't bad and had its moments, but I'd reserve a 5 star rating for "classics" and a 4 star rating for stuff like my favorite Warcraft novel, "The Last Guardian". Anyways, this book. As I said, not bad for what it is, which is Warcraft-related light reading. My main issues with it were primarily that a.) there is never really a huge sense of danger, and b.) there's nothing really gripping about the story as a whole. You're readi This book makes me wish there was a 3.5 stars. I dunno, it certainly wasn't bad and had its moments, but I'd reserve a 5 star rating for "classics" and a 4 star rating for stuff like my favorite Warcraft novel, "The Last Guardian". Anyways, this book. As I said, not bad for what it is, which is Warcraft-related light reading. My main issues with it were primarily that a.) there is never really a huge sense of danger, and b.) there's nothing really gripping about the story as a whole. You're reading about characters like Jaina, Thrall, etc. who clearly survive (this book is pre-WoW), and the the "climactic final battle" lasts about... one page, maybe? And the bad guy is never really all that scary. Still, I wouldn't peg much of this as being the fault of the author's; he did well with what he had to work with. There are some fun character moments sprinkled throughout. (The author is really good at making minor characters more interesting than the major ones.) It's also pretty obvious that he's played WoW-- at least enough of it to get through Durotar and the Barrens, as various in-game landmarks from both areas make prominent appearances, to the point that it almost (but not quite) feels like "trying too hard". Cycle of Hatred is a story set in the Warcraft universe created by Blizzard Entertainment. Despite being listed as the first in a series, relies heavily on the reader being aware of previous story. A time of tense peace has settled over the continent known as Kalimdor. Two States have emerged following a war against demonic forces. One, of humans ruled over by the most powerful wizardess to have ever lived. The other, a nation of Orcs, former slaves of both the Demons, and then the Humans, under Cycle of Hatred is a story set in the Warcraft universe created by Blizzard Entertainment. Despite being listed as the first in a series, relies heavily on the reader being aware of previous story. A time of tense peace has settled over the continent known as Kalimdor. Two States have emerged following a war against demonic forces. One, of humans ruled over by the most powerful wizardess to have ever lived. The other, a nation of Orcs, former slaves of both the Demons, and then the Humans, under a charasmatic shaman. This is not a world of tranquility though. This peace, based on a war-time alliance against a common foe is only maintained by the leaders' respect for each other. The common people believe the worst of the other. The title is apt and especially true for the Orcs as they are trapped in a cycle of oppression, hatred, and violence that few can, or want to see their way out of. A parallel is the stories of 3 human women presented, showing their own captivity, and freedom in a male dominated world. However, none of these stories is explored in much detail, the eBook being only 272 pages. Cycle of Hatred is actually a prequel to World of Warcraft and sets a whole year before the events of WoW, telling the story of Orcs and Humans on Kalimdor, living in the somewhat peace that both Thrall and Jaina Proudmoore have created. However, the tension between these two unlike races is still there and old hatred is not easily being forgotten. Basically, this novel is all about how easily the peace between Orcs and Humans is being disrupted, how hard both Thrall and Jaina try to keep it but Cycle of Hatred is actually a prequel to World of Warcraft and sets a whole year before the events of WoW, telling the story of Orcs and Humans on Kalimdor, living in the somewhat peace that both Thrall and Jaina Proudmoore have created. However, the tension between these two unlike races is still there and old hatred is not easily being forgotten. Basically, this novel is all about how easily the peace between Orcs and Humans is being disrupted, how hard both Thrall and Jaina try to keep it but no matter what they do, their races are still about to fight each other once again. It's a nice read, really. The story was more focused on Jaina and her finding a way to restore peace than on Thrall and his orcs. Jaina's side provided some nice additional information on how magic works, as well as some background on Aegwynn and the Guardians of Tirisfal. A small story that bridges the gap between the end of 'The Frozen Throne' and the beginning of World of Warcraft. In that sense, I enjoyed the extension of continuity between the two. It was nice to see Thrall and Jaina in the focus, since they are two of the more interesting, non-evil characters still alive in the franchise. The conflict in this book is also a cute nod to the original conflict in the franchise. The addition of a third character from way back in the Warcraft lore was also a nice A small story that bridges the gap between the end of 'The Frozen Throne' and the beginning of World of Warcraft. In that sense, I enjoyed the extension of continuity between the two. It was nice to see Thrall and Jaina in the focus, since they are two of the more interesting, non-evil characters still alive in the franchise. The conflict in this book is also a cute nod to the original conflict in the franchise. The addition of a third character from way back in the Warcraft lore was also a nice touch. Putting this in my "Read/Completed" pile to get it out of my "In progress" queue. I got to page 36 and put it down. I have no intention of finishing it. The author's ability to craft the personalities of Thrall and Jaina is atrocious and should be ashamed. To hold the mantle of being the first of the "World of Warcraft" series of novels, it fails miserably at kickstarting its reputation.